Are you looking for today lottery results online? This article is about how to check Maharashtra Rajya lottery results online. Check Maharashtra state lottery weekly, monthly results online using those simple methods. Maharashtra Rajya Lottery/State Lottery is very much popular scheme and trustable lottery scheme in India. Maharashtra State Lottery is one of the few which is authorized and legal lottery scheme in our country India, which is organized and manage by Government of Maharashtra state. There are number of lottery schemes are offer by Maharashtra State Lottery. Daily, Weekly, Monthly, Special Schemes, Bumper Offers and Festival schemes are very much popular among the lottery purchaser. In this article, we talk about how you can check Maharashtra Rajya lottery results online. Read this article carefully to know about results of Maharashtra state lottery online. Maharashtra Rajya Lottery is sponsored by Government of Maharashtra state. 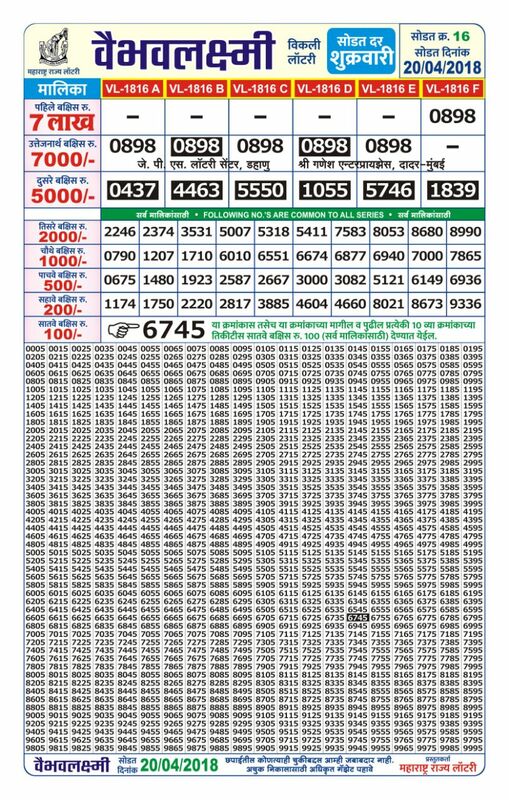 This is purely authorized and maintained by State Government of Maharashtra lottery department. There are various schemes are available in the name of "Maharashtra Rajya Lottery". We have listed the most famous and regular lottery schemes which are offer by state lottery. Along with those lottery schemes, there are other mini lottery schemes are also offer by state lottery department. We update this article regularly to provide latest information about lottery schemes. Now let's know how you can check Lottery results online. We've given information about Weekly, Monthly lottery schemes lottery results. To check other lottery results which are mentioned above, you can check our other articles or can follow the same process which is mentioned below. How To Check Maharashtra Rajya Weekly Lottery Results Online? Weekly Lottery schemes: Which are offer on weekly basis. But we can also call those lottery schemes as Daily Lottery schemes. Because, those lottery are available on daily basis, but in the name of different, day wise repeat every week. 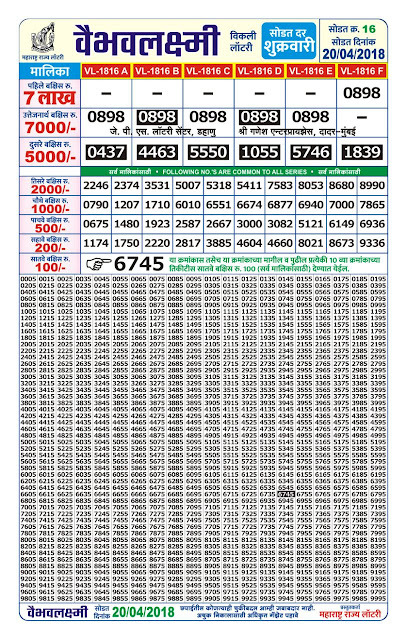 We have enlisted the daily, weekly lottery schemes below which are organize by Maharashtra Rajya Lottery. On Monday, there are two lotteries draw by government lottery department. On Tuesday, there is a lottery scheme every week name "Padmini Lottery". On Wednesday, there are two lotteries draw. On Thursday, there are two lotteries draw. On Friday, there is a lottery scheme name "Vaibhav Laxmi". Note: There are other mini lottery schemes available. We update this post regularly with the information about mini lottery schemes. The above mentioned lotteries name is daily, but periodically present on weekly basis. There is no weekly lottery available on Sunday. If you want to check daily, weekly lottery results, then visit the website of lottery department where you can match lottery ticket numbers with official lottery results available on official website of Maharashtra Rajya lottery. Maharashtra State Lottery also offer monthly lottery schemes. The results of monthly lottery schemes declares every month during third week of the month. The results dates are already printed on lottery tickets. Lottery purchasers should check the lottery results dates so that they can check lottery results on the same date online. To check lottery results of monthly schemes, you can visit official website of Maharashtra state lottery department. On this website, you can find all the necessary information about Maharashtra state lottery including schemes, offers, about lottery department, how to claim ticket prize and relevant information. Have any question regarding Maharashtra Rajya Lottery? Post your queries in comment and we'll help you to find correct solution!